It looks like I might need to ramp up production of my programming videos, to handle an influx of new student viewers. Fun times on the interwebs this week. The backstory: when blue-collar workers have lost jobs and seen their communities waste away in recent years, the response from the white-collar establishment has been some version of, “Learn to code.” In other words, just go learn a completely new trade and find a job somewhere in the tech industry, probably moving your family to do it. The coal mine closed due to new environmental regulations? Learn to code. Your factory moved to Mexico? Learn to code. Your job at the slaughterhouse was given to a Somali because he’ll work for minimum wage and zero benefits? Move to Silicon Valley, let your hometown die, and learn to code. Kevin Williamson, then of the supposedly conservative National Review, summed up the attitude: “The truth about these dysfunctional, downscale communities is that they deserve to die. Economically, they are negative assets. Morally, they are indefensible.” That was the message from white-collar elitists: People and their communities are economic assets to be moved around by smarter people like houses on a Monopoly board. If they aren’t profitable, break them up, move them around, or trade them in for better models. And they don’t come any more white-collar elitist than journalists. So when some journalists – by which I mean clickbait writers – were laid off this week, some of those “negative assets” remembered, and took to Twitter to share their own advice with them. 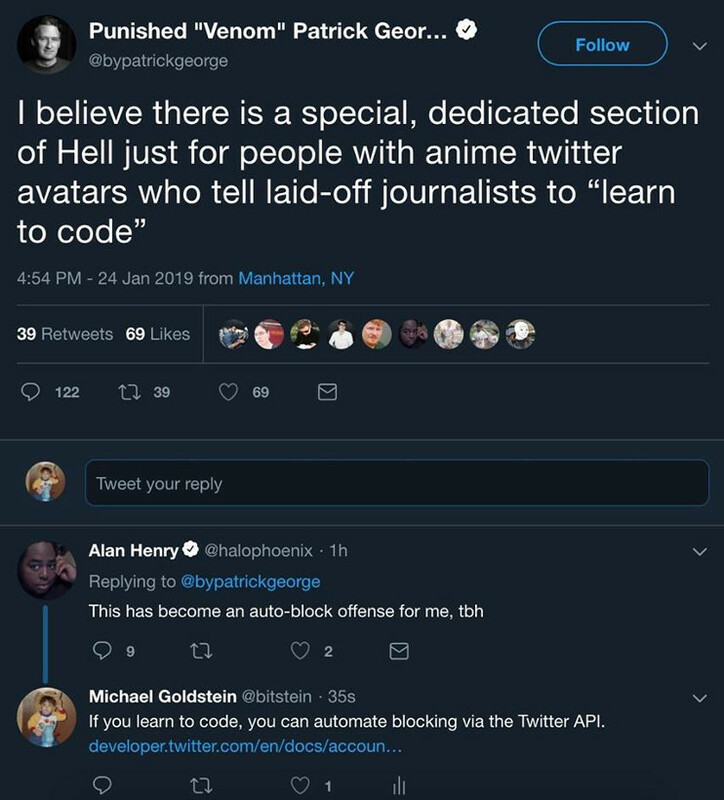 Because the media can dish it out but can’t take it, they reacted as if telling them to #LearnToCode was a hate crime, and blamed it all on 4chan trolls. Good stuff. Watching people hoist on their own petard is fun, but seeing them double-down and make it worse is priceless.